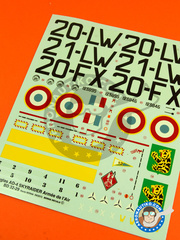 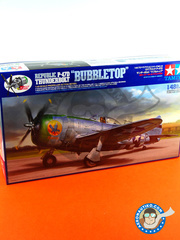 We are preparing a high-flying summer, just like you deserve, with a good pile of new products: Berna Decals delights us with several decorations focused in French Air Forces for the P-47, some A-1 Skyraider, the monstruous Avro Lancaster, and the Mirage 2000. 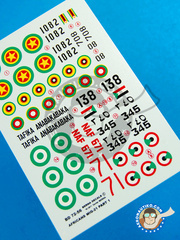 Also very interesting are the decorations for the MiG-21 from African air forces and the Spanish Mirage F1 units participating at the NATO Tiger Meet. 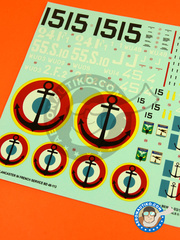 Designed in Spain, we bring you three very summer-like decorations for the Spanish Air Forces Hornet. 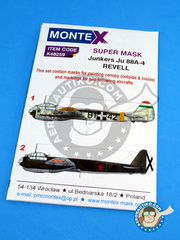 And straight from the Czech Republic, by the hand of Montex Masks, several masks and decals for the Japanese, Spanish and Hungarian units from the World War II. 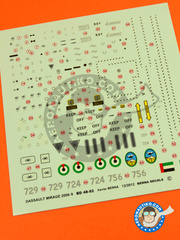 Start enjoying your summer now at Aeronautiko!! 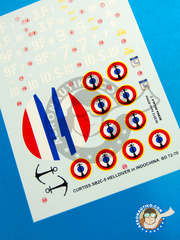 Decals set with decorations for several different French P-47 units operating during the Second World War. 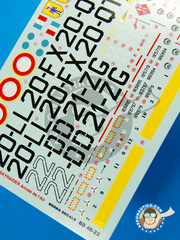 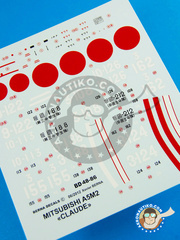 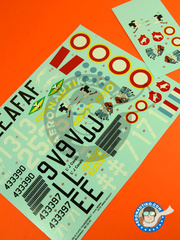 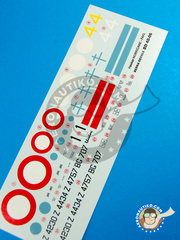 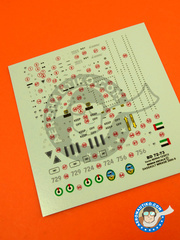 This set includes registration markings for 8 different units. 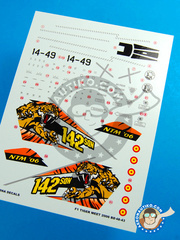 Awesome!!! 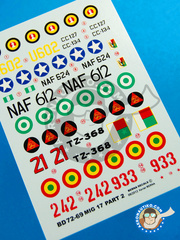 A new issue of the French P-47 units decals operating by the end of the Great War. 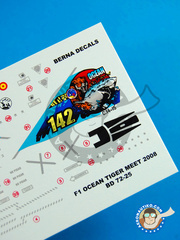 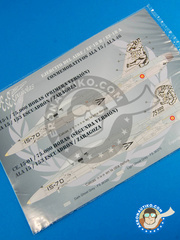 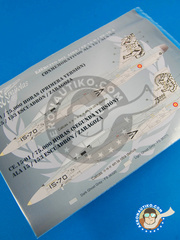 A simply spectacular decoration of the Mirage F1 from the Ala de Caza 14 of the Spanish Air Forces participating in the 2006 Tiget Meet, that you can now recreate with this sheet from Berna Decals. 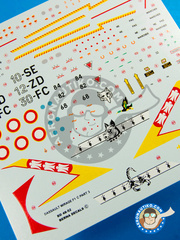 Set of four decorations for the Alsatian Combat Group 1 Hurricanes operating in 1942. 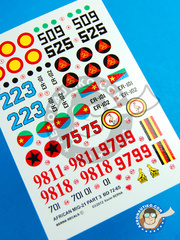 Here are 5 decorations for the Skyraider units of the French Air Force on duty at Madagascar, Chad and Algiers. 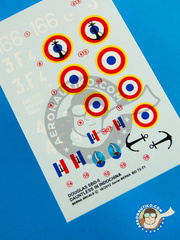 Three decorations for the units belonging to the RAF that served at Indochina under french flag. 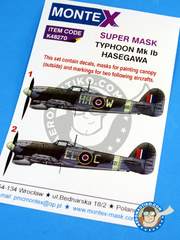 Here are the excelent masks from Montex Mask for recreating two Hawker Typhoon decorations at the RAF during the summer 1943. 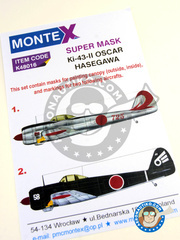 As the house rules say, the kit also includes masks for the canopy. 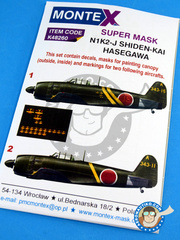 The set includes canopy and decoration masks, matching two units that flew at Japan in April / May 1945. 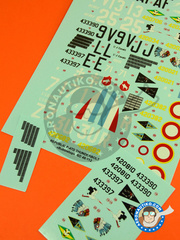 Set including one masks sheet for the cockpit, a second one for the Spanish air force markings, and a third one for the Hungarian air force. 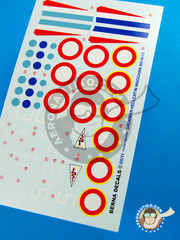 This decals set by Series Españolas can be used to reproduce the following decorations: CE 15-1 / 75000 hours - first version, Ala 15, 153 Escuadron, Zaragoza, Spain; CE 15-1 / 75000 hours - second version, Ala 15, 153 Escuadron, Zaragoza, Spain. 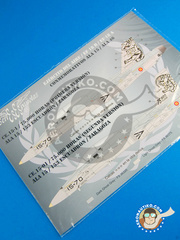 This decals set by Series Españolas includes several decorations, but we really liked the spectacular one corresponding to the 75000 flight hours of the Ala 15, 153 Escuadron, Zaragoza, Spain. 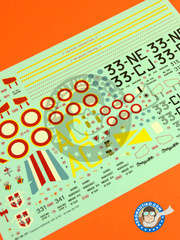 This decals set by Series Españolas includes the following decorations: CE 15-1 / 75000 hours - first version, Ala 15, 153 Escuadron, Zaragoza, Spain; CE 15-1 / 75000 hours - second version, Ala 15, 153 Escuadron, Zaragoza, Spain. 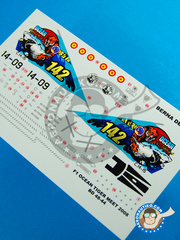 A gorgeous decoration for the Mirage F1 belonging to the Ala de Caza 14 of the Spanish air force at the Ocean Tiger Meet 2008. 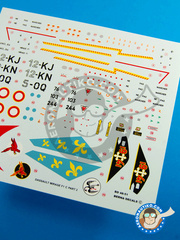 The set includes four decorations of the French air force planes operating at Indochina. 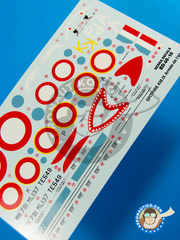 The set incudes an electric motor for the propeller as well as decals for the version piloted by Mayor Gen. William Kepner at the 551st FTS, 495th FTG, Mounth Farm Air Base during autumn 1944.